Miranda, always taking the spotlight. Nobody cared much about this small world, about the size of Louisiana, until January 24, 1986, when a (relatively) primitive but stout robot Voyager 2 sailed past - just 4 days before Challenger. (I had the opportunity to return to JPL to witness the encounter but as my doctoral exams were not going well, it was "suggested" I stay at Wash U and study.) Expectations were not especially high, and Miranda was expected to look a bit like Saturn's lumpy moon Mimas, although given Voyager's history, anything was possible. Voyager's path to Neptune took it closest to Miranda of Uranus' five larger classical moons. Resolutions as high as 250 meters were possible, among the best of the entire Voyager mission. Happily, most of these images came back unsmeared and sharp. They revealed a complex and evolved landscape. 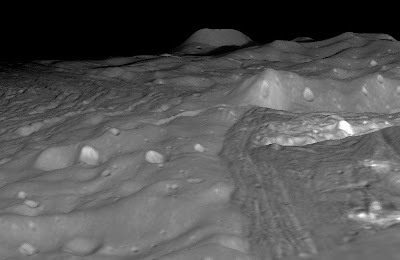 Half of Miranda looked indeed a bit like cratered Mimas, but the other half was paved over if you will by lanes of ridges and grooves vaguely (and misleadingly) reminiscent of grooved terrain on Ganymede, all concentrated in three ovoid or retangular regions called coronae. This tiny moon with the multiple personalities has fascinated researchers ever since. Most now agree that Miranda attempted to turn itself inside out due to residual formation or forced tidal heating. Soft warm ice oozed up in three (or more) convective cells, forming the ovoid coronae on he surface where some of this ice breached the surface. Alas, only 45-50% of the surface was visible in sunlight at the time due to the fact Uranus and its moons being at southern solstice in 1986. Efforts to return to Uranus and Neptune have so far met with frustration. 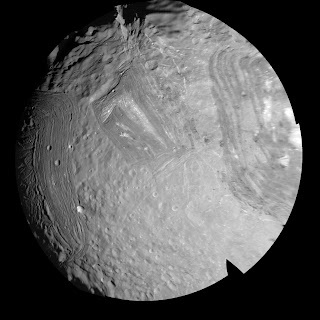 Perhaps the images shown here of Miranda, Ariel and Triton will relight the fires of interest in these planets and their active moons. 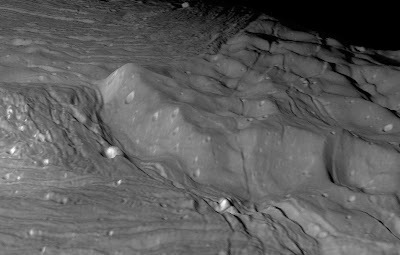 Flyover of Miranda, Uranian moon. Imaging data acquired January 1986 by Voyager 2, topography derived by P. Schenk. The total topographic relief shown here is roughly 10 kilometers. 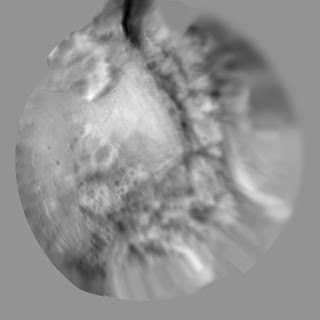 Note that we are seeing roughly half of the entire moon here (which is roughly 500 km across), but the data are shown in flat map projection (the renderer cannot as yet handle a true sphere). 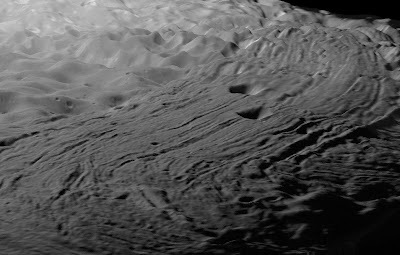 The movie begins with an approach toward Elsinore Corona, one of the ovoid regions of ridges and grooves. It then turns toward and over Inverness Corona, a smaller region of resurfacing very close to the south pole. 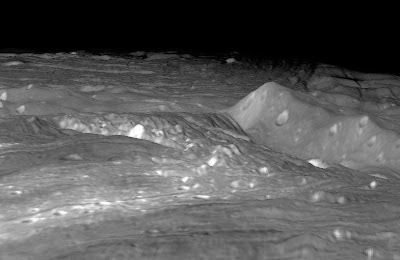 We end with a "landing" along the edge of the 10 km deep Verona Rupes fault canyon system. The first two views of Elsinore Corona, an ovoid shaped region resurfaced by ridges composed of water and possibly other ices. These ridges stand up to 2 kilometers high in some locations. The rugged terrain nearby is ancient cratered highlands, which has relief of 5 kilometers or more. The next two views show the border between Inverness Corona and the more rugged cratered highlands. Inverness, like Elsinore, has been resurfaced by viscous ices that flowed onto the surface, forming ridges several hundred meters to a kilometer or so high. The cratered highlands have relief of several kilometers. 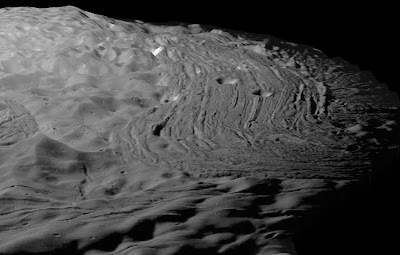 This area is the most rugged terrain known on Miranda. Up to 10 kilometers of relief has been mapped here, a complex area formed by the intersection of multiple tectonic features. These maps (image mosaic on top, topography on bottom) are in lambertian equal area projection, centered on the south pole. They have been reduced in size by a factor of 2 for the web. All images may be used with permission. Great stuff as usual. I assume the total vertical relief (black to white) in the global topographic map above is approximately 10 km as in the flyover movie? I ask because I really want to try putting this on a sphere to see what it really looks like :). That is truly amazing work! Miranda is well suited for it - lots of topography! Very nice article, I share your wish for a second visit. Take alsa look at another strange object, the moon Hypherion, around Saturn.